A major transportation hub, Omaha was once considered little more than a stopping point on a pioneer's journey west. Get ready for a full day of sightseeing on the next day: immerse yourself in nature at Arbor Lodge State Historical Park, identify plant and animal life at Fontenelle Forest Nature Center, and then take in the spiritual surroundings of St. Cecilia's Cathedral. For other places to visit, where to stay, and other tourist information, read Omaha trip maker tool . London, UK to Omaha is an approximately 14.5-hour flight. You can also do a combination of flight and shuttle; or do a combination of flight and car. The time zone changes from Greenwich Mean Time (GMT) to Central Standard Time (CST), which is usually a -6 hour difference. Traveling from London in May, things will get somewhat warmer in Omaha: highs are around 27°C and lows about 13°C. Cap off your sightseeing on the 16th (Thu) early enough to go by car to Lincoln. Lincoln is the capital of the U.S. Kick off your visit on the 17th (Fri): see the interesting displays at International Quilt Study Center and Museum, then identify plant and animal life at Spring Creek Prairie Audubon Center, and then steep yourself in history at Homestead National Monument of America. Here are some ideas for day two: look for gifts at Licorice International, get a new perspective on nature at University of Nebraska State Museum, then look for all kinds of wild species at Pioneer Park Nature Center, and finally learn about winemaking at James Arthur Vineyard. To find maps, where to stay, reviews, and more tourist information, go to the Lincoln trip builder . Traveling by car from Omaha to Lincoln takes an hour. Alternatively, you can take a train; or take a bus. Expect a daytime high around 27°C in May, and nighttime lows around 12°C. Wrap up your sightseeing on the 18th (Sat) to allow time to travel to Kearney. Kearney is a city in and the county seat of Buffalo County, Nebraska, United States. Get in touch with nature at Audubon Rowe Sanctuary and Cottonmill Lake. 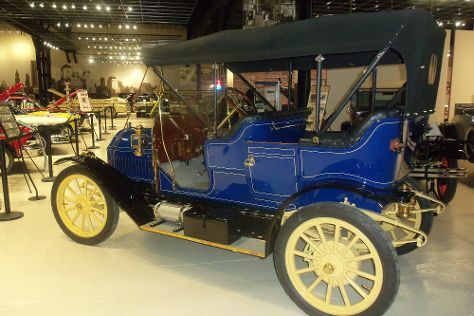 Discover out-of-the-way places like Classic Car Collection and Heartland Museum of Military Vehicles. Venture out of the city with trips to Hastings Museum (in Hastings) and The Willa Cather Foundation (in Red Cloud). And it doesn't end there: explore the world behind art at Museum of Nebraska Art, look for gifts at Stagecoach, take in the views from Hike-Bike Trail Bridge, and stroll through Yanney Heritage Park. To find ratings, reviews, traveler tips, and more tourist information, use the Kearney online route planner . Drive from Lincoln to Kearney in 2 hours. May in Kearney sees daily highs of 26°C and lows of 10°C at night. Finish your sightseeing early on the 21st (Tue) so you can drive to North Platte. North Platte is a city in and the county seat of Lincoln County, Nebraska, United States. Start off your visit on the 22nd (Wed): see the interesting displays at Sod House Museum, contemplate the long history of Original Pony Express Station & Museum, stroll the grounds of Fort McPherson National Cemetery, then pause for some photo ops at America's 20th Century Veterans' Memorial, and finally get engrossed in the history at Fort Cody Trading Post. On your second day here, see the interesting displays at 100th Meridian Museum, then admire the masterpieces at Robert Henri Museum, then examine the collection at Lincoln County Historical Museum, and finally steep yourself in history at Union Pacific Railroad Bailey Yard. To see more things to do, maps, traveler tips, and more tourist information, refer to the North Platte trip planner . Drive from Kearney to North Platte in 2 hours. Alternatively, you can take a bus. Traveling from Kearney in May, expect slightly colder with lows of 7°C in North Platte. Finish your sightseeing early on the 23rd (Thu) so you can travel to Burwell. Burwell is a city in Garfield County, Nebraska, United States. Start off your visit on the 24th (Fri): take a peaceful walk through Fort Hartsuff State Historical Park, then admire all the interesting features of Rowse's 1+1 Ranch, and then admire the majestic nature at Calamus Reservoir State Recreation Area. For reviews, more things to do, ratings, and tourist information, you can read our Burwell driving holiday planner. Drive from North Platte to Burwell in 2.5 hours. In May, daily temperatures in Burwell can reach 24°C, while at night they dip to 8°C. Finish up your sightseeing early on the 24th (Fri) so you can travel to Valentine. Valentine is a city in Cherry County, Nebraska, United States. Kick off your visit on the 25th (Sat): play a few rounds at The Prairie Club, then take in the views from Bryan Bridge, and then admire the majestic nature at Smith Falls State Park. On the 26th (Sun), you'll have a packed day of sightseeing: explore the wealth of natural beauty at Niobrara National Scenic River. To see more things to do, maps, other places to visit, and tourist information, read our Valentine online road trip planner . Traveling by car from Burwell to Valentine takes 2.5 hours. May in Valentine sees daily highs of 24°C and lows of 7°C at night. Cap off your sightseeing on the 26th (Sun) early enough to travel to Chadron. Chadron is a city in Dawes County, in the state of Nebraska in the Great Plains region of the United States. On the 27th (Mon), take in the dramatic natural features at Pine Ridge National Recreation Area, then admire the majestic nature at Chadron State Park, and then see the interesting displays at Museum of the Fur Trade. Plan a Chadron trip in moments using our itinerary builder. You can drive from Valentine to Chadron in 2.5 hours. The time zone difference when traveling from Valentine to Chadron is minus 1 hour. May in Chadron sees daily highs of 23°C and lows of 6°C at night. Finish your sightseeing early on the 27th (Mon) so you can travel back home.